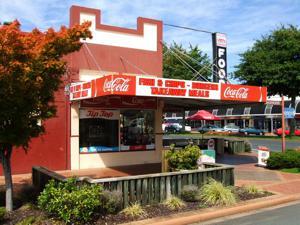 Rotorua Takeaways - Do you love fish & chips and burgers? I know I do. In fact, I'm sure I could live on them. What about Chinese or... our latest takeaway, Māori kai (food)? If it's a lovely day and you want something easy, buy your food then pop down to either the Lakefront, Government Gardens or Kuirau Park to eat it. Now, as a lot of our visitors stay in motels, hotels and backpackers close to the central city I'll focus on that area. If staying further out of the city, most of the small shopping centers have a fish & chip shop so don't worry, you won't miss out on your fix. 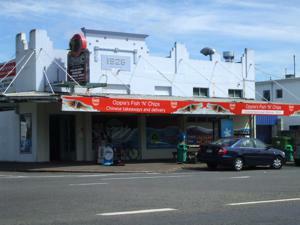 Before we start you may want to know the types of fish used for Rotorua Takeaways. Snapper is the crème de la crème of fish in New Zealand so it follows that it's pricey. You're probably looking at around NZ$5 for a battered piece. Next in line is Tarakihi which is also really nice. This is mainly what I order. From then on we have Gurnard, John Dory, Lemon Fish, Hoki and a few others that I forget the names of. Hoki is what you usually get if you ask for fish & chips without specifying the type. Yurk, I don't like that one. The King Size Burger Bar is a popular place to get fish & chips, burgers etc. It may be a tiny little shop but boy, it puts out some food. 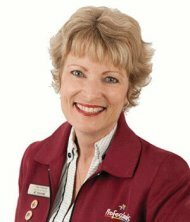 Sue - lovely lady by the way - has worked at this Rotorua takeaways for 32yrs and owned the business for the last 20yrs as at March 2013. That's a long time isn't it? She's built it up over the years gaining many regulars in addition to all the tourists that find her. You will find King Size situated right next door to the police station on the corner of Pukuatua and Fenton Sts. It's handy to a number of the Backpacker accommodations and to the iSite building which is where the intercity buses arrive and depart. 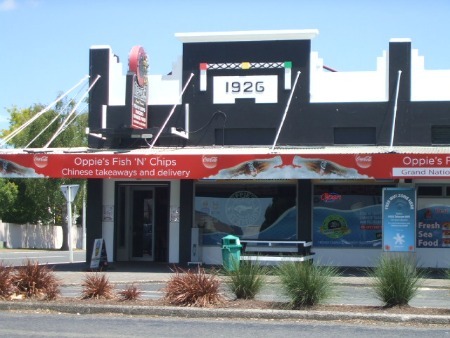 Oppie's Fish & Chips is also a Chinese takeaways and a Roast House. 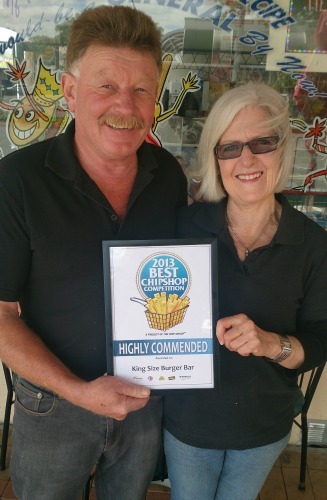 They have been winning awards left, right and center for the best chips (a NZ award) and also best retail business (a local award). Well done to Michael Huang and his kung fu kitchen as he calls his staff. Don't be surprised too if you go to this takeaway and get served by a little scrap of a thing no bigger than a grasshopper. The whole family gets in on the act. I don't normally go to Oppie's. Why? Because it's too busy most of the time. 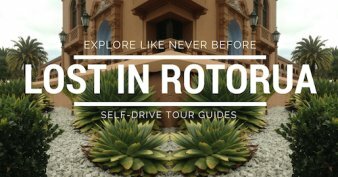 When a girlfriend from Australia wanted to try the best chips in the land we decided to check it out. She fell in love with their chips and went back twice more before she returned home. Unreal! By the time she left I was over it and couldn't face fish & chips for a while. Although Joe's has closed, time marches on and fresh winds blow in. 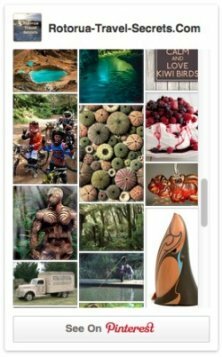 Numerous visitors would love to experience a Māori hangi without the accompanying cultural show. To that end, the newly refurbished diner has reopened as Kiwi Kai Takeaways, with yummylicious Māori and Kiwi food including the hangi. Sadly, after many years of being the go to place for munchies in the wee hours, Joe's Diner is no longer operating. Joe is getting on in years so must have decided to hang up his apron. Joe and Joe's diner will be missed that's for sure. Thanks for the memories Joe... and there are lots. If none of these Rotorua Takeaways appeal, dig a bit deeper on Zomato. It's our most popular search engine for eating out with numerous search filters, and reviews by diners. Thanks for visiting and bon appétit.